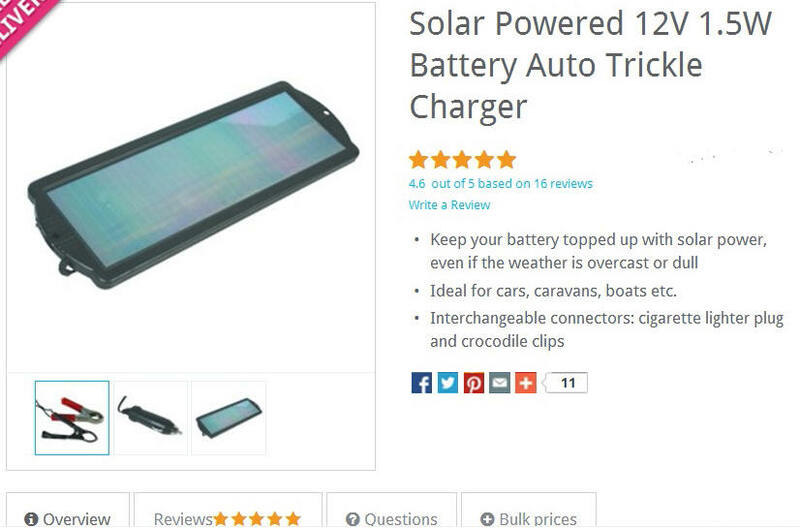 in order to trickle charge my 2 batteries when the yacht is left unattended? You may have guessed by now that I know next to nothing about electricity and all things electrical. 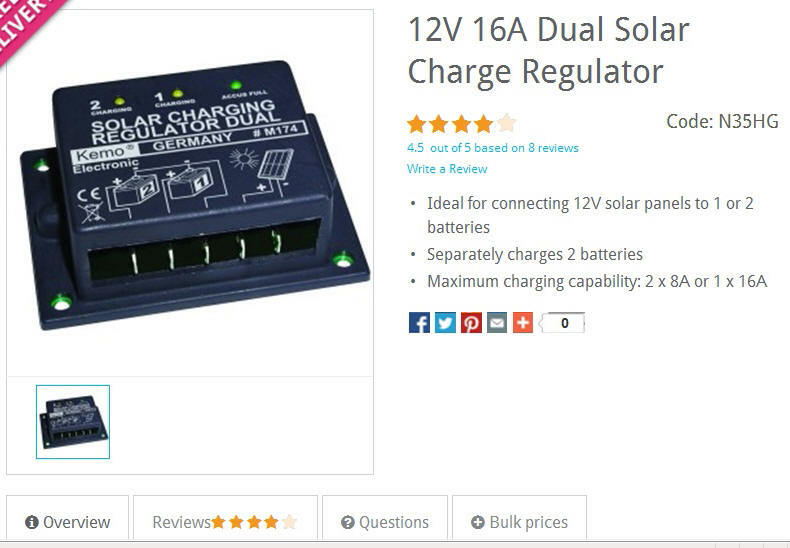 The solar panel shown above is rated at 1.5W, while on the regulator description it states "Maximum charging capability 2 X 8A or 1 X 16A"
So, will a panel rated at 1.5W be able to "send enough power" to trickle charge the 2 batteries ???
. . . and if not, any sensible suggestions welcome! The older I get . . . the better I was. It could keep two AA batteries full, thats all. I have had one on my C27 for over a year and it does a good job keeping up my 200ah for weekends. Can't keep up with daily use for a week but good for weekending. I paid $90 for mine and saw the kit for the same a week ago, don't understand the $113 price tag. It can keep up with battery self-discharge and a few small outputs. It will not cope with daily use or even moderate demand on a leak & bilge pump. Lets assume your location first. What percentage of bright sun light do you get each day year around? I bet very little as your in Scotland, only you know this living there. Then lets look at your solar cell you have picked out, normally I would want at least a couple of amps minimum in Texas. The charger you have puts out 1 watt and it takes 12 watts to make one amp so your charging rate would be 1/12th of an amp. The regulator alone would require all the 1/12th amp just to operate. The average boat would need about 5 amps to do a good job while you are on it and that goes up with your required loads you use. Lets say you get 3 hours of sun daily and the rest is fogy or clouded over, you would need maybe an even larger panel. I can not say for sure but clouds an rigging block sun and your charging stops when this happens. I would look at 5 amps or 60 watt solar panel to begin with. The regulator will top off the batteries and take care of this area. If you have a leaky boat an the bilge pump runs daily then this would come closer taking care of your needs. When sailing ,an autopilot in use, it will take care of a tiller pilot as well if the sun is shining there. You would need to get a larger regulator though as it is 15 watts and you need at least 60+ watts, I would go for a 75 watt an have a little room over your 60 watt panal limit. The 1/12th watt would barely keep a D cell from a flashlight charged an cold weather would null it out. This is what I would do an also plan on running larger wires from the cell to the regulator and cables to the battery buss or use a battery isolator to charge them off of when they are in OFF position on your battery selector switch. This way it will know when each battery is charged and allow the lower one to charge higher as the charged battery is taking no power at ths point. I could keep going but I think you get the idea. Unless you're charging a motorcycle battery I don't think you need a regulator. 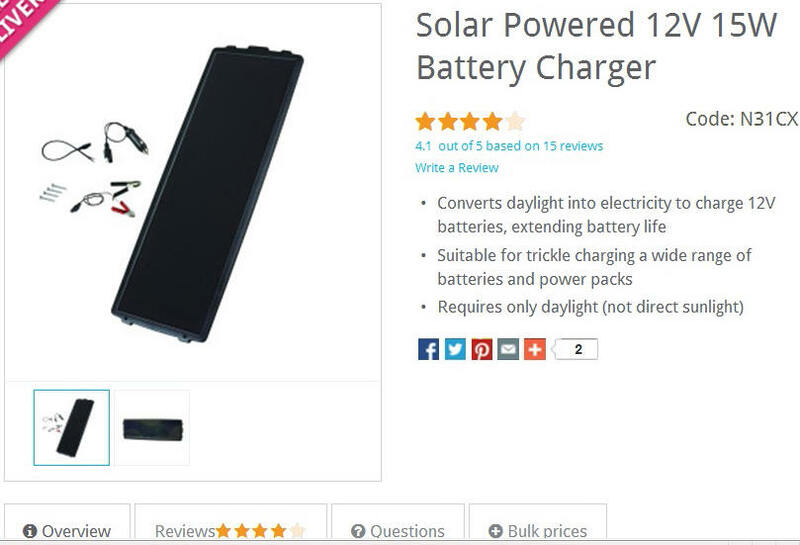 Is it practical to use that solar panel...with what battery for what purpose? It is designed as a battery maintainer, not a battery charger. It will maintain a full battery or bring a slightly discharged one back to full, but it is not designed for deep cycle charging. And when used as a maintainer, with a typical Group 24 or larger battery, no regulator is normally needed. As it's rated at 10 times the output of the first one (15W instead of 1.5W) is this what I should be looking at? Its intended use is just to help maintain the charge in the batteries while in the marina, and NOT for charging from flat. As for living in Scotland ~ it's probably the general perception that we live here in constant gloomy, misty, wet conditions! . . . but that's just not really the case. Sure, we get our share of the above (occasionally it may feel like more than our share!) but we also get our share of sunshine and brightness. Unfortunately, particularly in that season commonly called "summer" when we can see a lot of sunshine, it isn't always accompanied by the heat that we would like!